I don’t want to sound redundant but have I mentioned how much I love summer fruits? Dark, firm cherries are amongst my favorites and even though the season is short, I always manage to take advantage of it while it lasts. 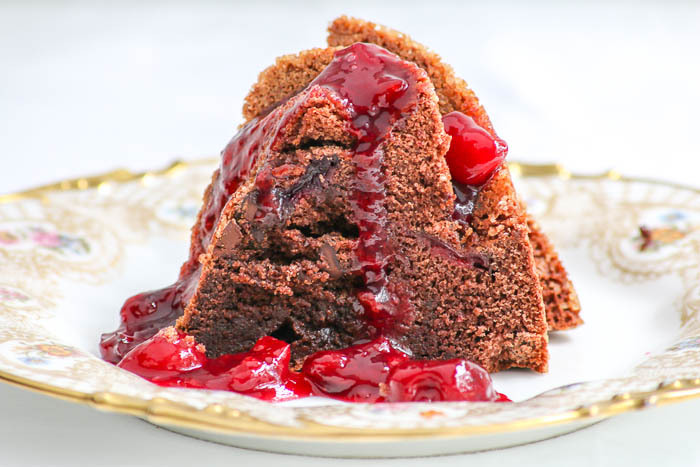 Chocolate Cherry Bundt Cake has a deep dark chocolate cake and the cut up cherries add a lovely not-too-sweet taste. 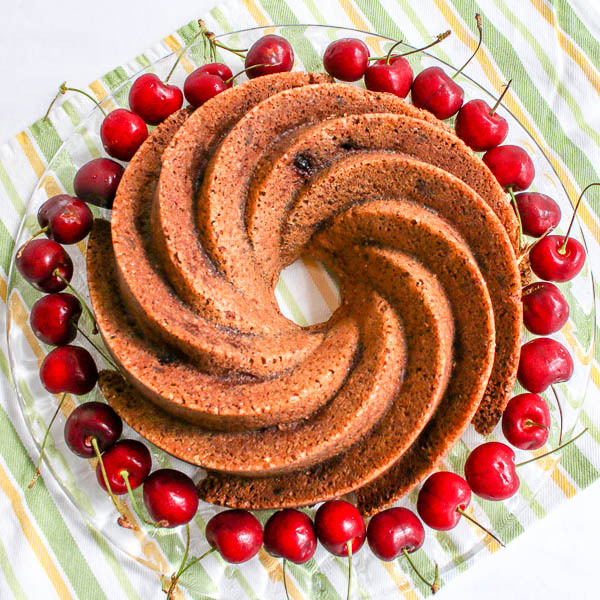 Tossing cherries with a bit of flour just before adding them to the batter prevents them from dropping to the bottom of the cake. 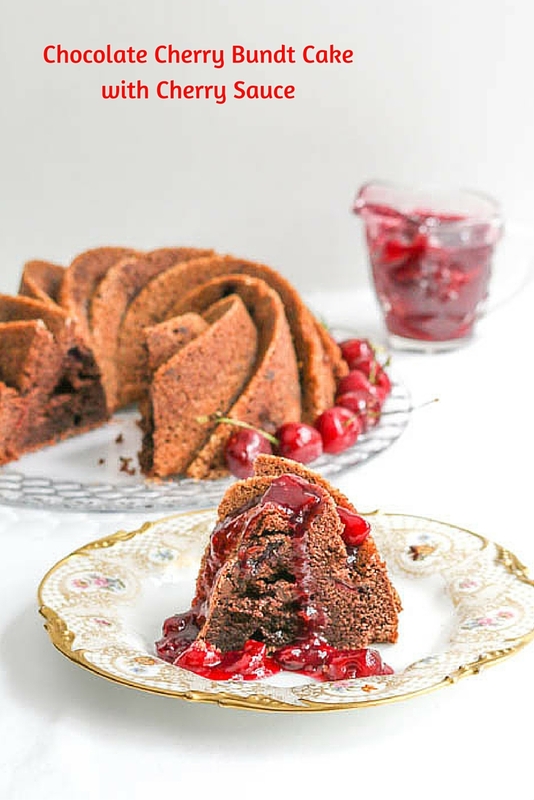 The cherry sauce is outrageous and I strongly recommend serving it with the cake. However, I must admit that the cake on its own is out of this world. I know, may this be our biggest conflict. One other note worth adding, I dusted my pan with turbinado sugar but cocoa powder would work well, too. 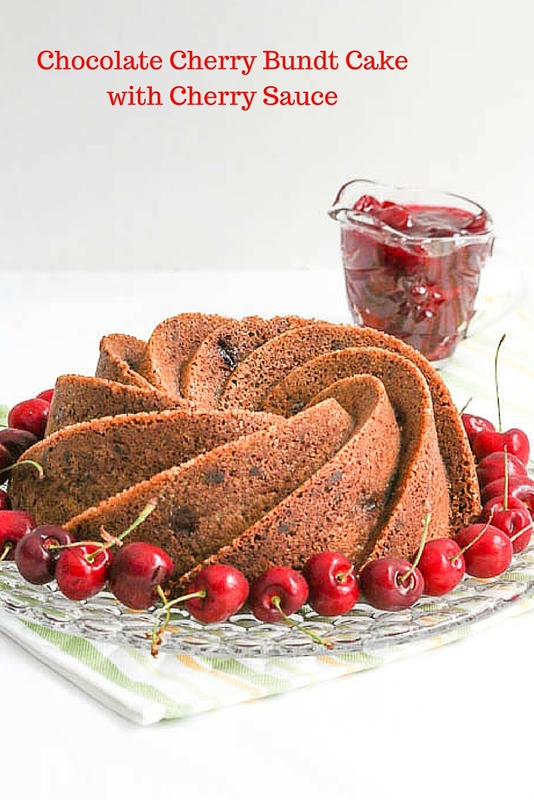 Nordic Ware Platinum Collection Heritage Bundt Pan As an Amazon Affiliate Partner, I earn a few pennies when someone buys through Desserts Required but the only products I list are ones I like, too. Butter a 10 cup bundt pan and dust it with turbinado sugar. Pit the cherries and cut them into quarters. Set aside. Whisk together 2 cups of flour with the cocoa powder, baking soda and salt in a small bowl. Set aside. Place the butter and sugar into a large mixing bowl. Beat until smooth and creamy, about three minutes, scraping the bowl down as needed. Add the eggs, one at a time. Blend in half of the dry ingredients followed by the sour cream and vanilla. Add in the remaining dry ingredients. Stir in the chocolate chips. Place the cut cherries into a plastic bag. Toss with the remaining tablespoon of flour. Fold the cherries into the batter. Bake at 325° for 50-55 minutes. Remove from the oven and cool for 10 minutes. Cover the pan with a cooling rack and flip the pan upside down. Remove the pan and cool. Pit the cherries and place them into a medium size saucepan with the water, sugar and cornstarch. Cook over medium low heat. Once the mixture boils, cover the pan and cook for 10 minutes, stirring occasionally. A wooden spoon will leave a line when pulled through the sauce. Remove from the heat and serve hot, room temperature or cold.